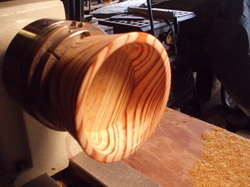 How does it get from wood block to bowl? 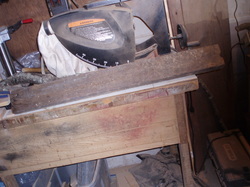 I love to work with old, gnarly wood that I can reclaim or salvage. 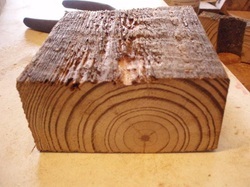 This piece was a pine plank taken from a very old house during a remodeling project. The wood was over 100 years old and, well, didn't look that pretty as you can see. Oh, but the ugly was only skin deep. The beauty within was amazing. 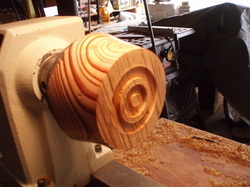 After attaching the block of wood to my lathe and giving it a whirl (not to mention using a few cutting tools) an interesting little form began to emerge. 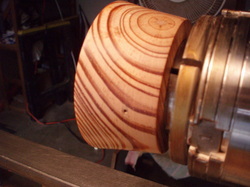 The aroma of pine was strong and the sticky sap meant many stops to clean my tools. 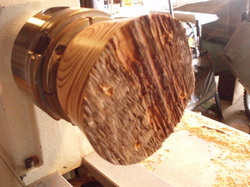 A little more turning and cutting - it finally started to look like a bowl. Not only was the grain beautiful in this old wood, but look closely and you can see the nail hole. Oh yeah! Done. 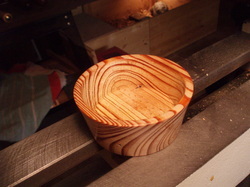 A beautiful little bowl from reclaimed antique pine wood that was once destined for the trash heap. One's trash, another's treasure. Go to http://www.hendywood.etsy.com for more bowls (when in stock).